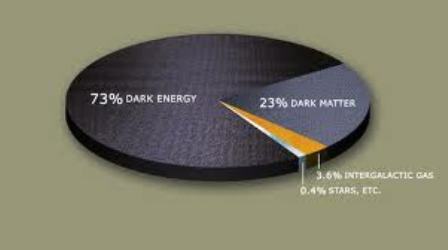 What is Dark-Energy? Well...to tell the truth, no one really knows. As is the case with Dark-Matter, we can only assume that form of energy exists because of the measurable physical effect it appears to have on the Cosmos as a whole. As indicated on the pie-chart illustrated below, its effect is overwhelming. 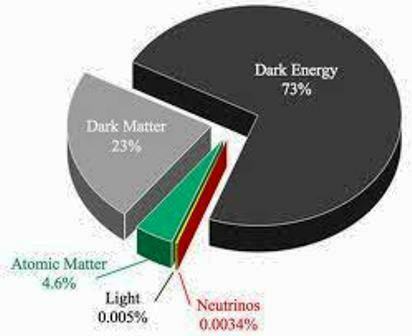 A recent WMAP report estimates these proportions as 72.8% Dark-Energy, 22.7% Dark-Matter, and Ordinary Matter (in other words ALL the observable matter in the Universe including us!) accounts for only the remaining 4.6%. 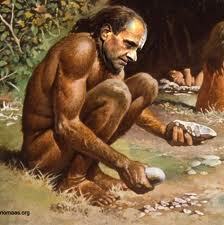 "The nature of this dark-energy is a matter of speculation. It is thought to be very homogeneous, not very dense and is not known to interact through any of the fundamental forces other than gravity. Dark energy can only have such a profound effect on the universe because it uniformly fills otherwise empty space. Independently from its actual nature, dark-energy would need to have a strong negative pressure (acting repulsively) in order to explain the observed acceleration in the expansion rate of the universe." All Creation Is Built On Paradox Of Dynamics Between Opposing Forces. Opposites attract - Likes repel. This is a well established law known in Quantum Physics as The Second Law Of Thermodynamics . It is the harnessing and application of this principal that has driven our industrial revolution. "This of course immediately raises the question of what was preventing the "negatively charged" electrons of atoms from permanently attaching themselves to the "positively charged" protons in the nucleus of the atom instead of just orbiting around them?" 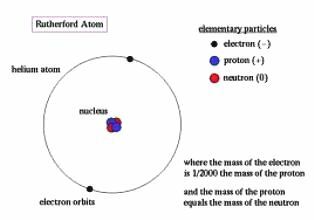 Research into this paradox has led to the discovery of sub-atomic particles now known as Quarks and Baryons, which emit countering neutralizing forces that keep the electrons in orbit arround the nucleus of an atom. Gravity and Anti-Gravity: These are the two forces determining the nature of Dark Matter on the one hand, and Dark Energy on the other. The main problem of course stems from the fact that no one knows how or why Gravity itself actually functions. Some researchers label Gravity as being the last remaining unknown force of nature still to be explained by quantum physics. "In fact a negative pressure does not influence the gravitational interaction between masses-which remains attractive-but rather alters the overall evolution of the universe at the cosmological scale, typically resulting in the accelerating expansion of the universe despite the attraction among the masses present in the universe." In other words, although Dark-Energy permeates everything, it does not nullify the gravitational effects of Dark-Matter which holds each Galaxy together, as well as some "super-clusters" of Galaxies (in our case the Milky Way and the Virgo super-cluster). On a Cosmic scale however Dark-Energy is driving these Galaxies further apart from each other, and it is doing so at an ever accelerating pace. Another puzzling fact is that initially, after the first expansion of the Universe was set in motion with the Big-Bang, the rate of acceleration was evidently starting to actually decrease due to the gravitational effect of Dark as well as Observable Matter. This was the period when Matter started coming together to form the first generation of Primitive Stars. 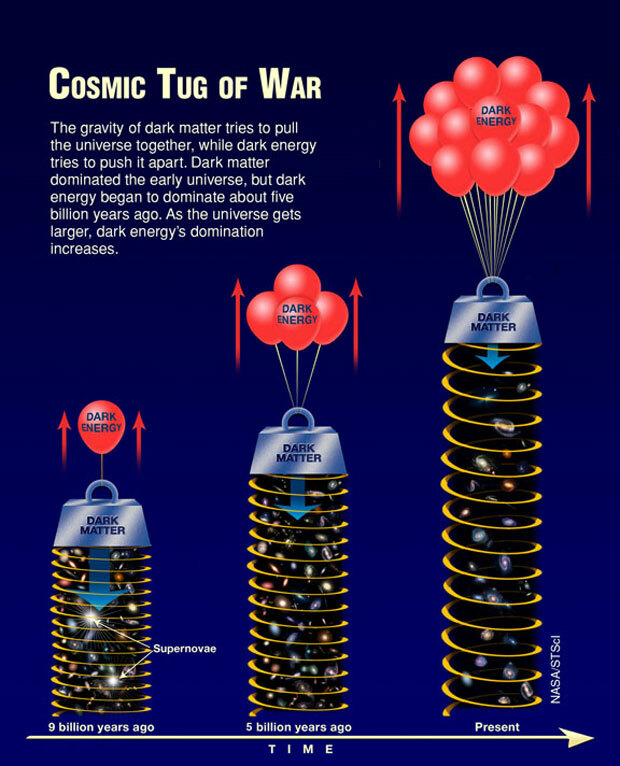 Dark-Energy vs. Dark-Matter: The Cosmic Tug Of war. What Does This Imply Concerning The Ultimate Fate Of The Universe? The first obvious scenario would be that the excelerating expansion of the Universe would eventually reach a threshold where the "velocity" of this expansion would far exceed the speed of light. Accordingly, if the current increase in the rate of acceleration is maintained and all other parameters remain constant, this threshold will be reached approximately 16 billion years from now. At this stage the rest of the Universe would inevitably disappear from view because they would be travelling away from us at a speed faster than the light they were emitting would travel towards us. 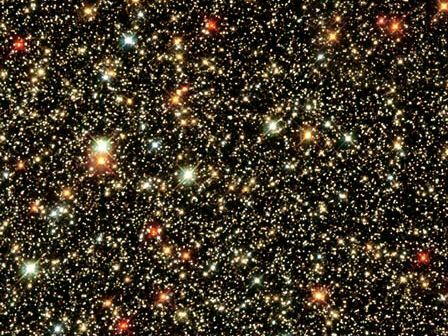 This light would then no longer reach us, and the night sky, apart from the Milky Way and the Virgo super-cluster, would become dark and empty. This leaves us with the disheartening and chilling prospect of the Cosmos as we observe it eventually just fading away and disappearing. 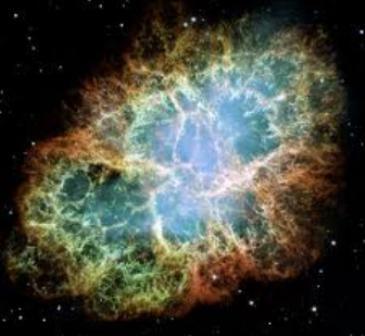 In effect our Universe, popularly believed to have originated with a "Big Bang", will ultimately dissipate and just disappear without even so much as a whimper! Gone forever! Another possibility is that Dark Energy will continue to increase in intensity until it becomes so powerful that it overwhelms all other bonding forces throughout the Universe. The entire Cosmos - Galaxies, Solar systems, and even the components of the very Atoms they consist of - will be "ripped" apart and cease to exist. There is also a third possible scenario. Remember, we are dealing here with powers (including Gravity itself) that we don't understand. So it cannot be taken for granted that the prevailing dynamics driving the Cosmos are set in stone for all time. How can we be sure that there is not some unknown built-in neutralizing force that may eventually come into play and swing the pendulum in another direction? This could lead to the gravitational forces of Dark Matter, as well as Visible Matter becoming dominant once more causing the Cosmos to start falling back on itself again. If this occurred and continued unhindered, then all matter would become continuaully more compressed with increasing intensity until all matter would eventually revert to the "Zero-Point Field" state of which matter consisted at the initial instigation of the Big-Bang. It is further postulated that this might presuppose a new Big-Bang which would then set the whole process in motion once again. In other words the Universe might in fact be subject to eternal cycles of birth, expansion, contraction, demise and re-birth. Which will it be? No one really knows. Dark-Energy, like so much else, remains an unexplained enigma! The first impression I became aware of on learning about dark-energy and its impact of the entire Cosmos, was a sense of inadequate awe when attemting to comprehend its powerful immensity! Words such as "all encompassing", "all infusing", "awesome", "omnipresent", "omnipotent", "incomprehensible", and "all powerful" come to mind. 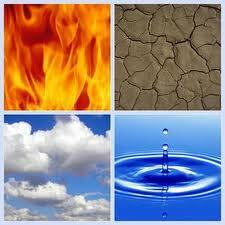 Strangely, however, aren't these the same words we use when we attempt to comprehend and describe God our Creator? 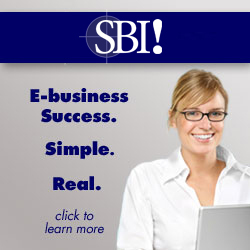 Surely the obvious similarity is significant? We start by inquiring "what-is-matter". 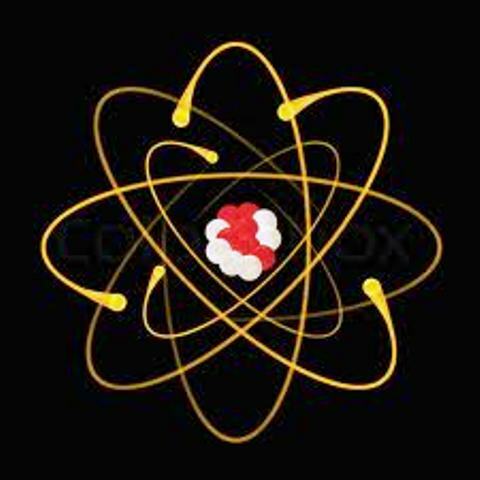 We study all of Nature, from the vastness of the Universe, to "atomic-structure", to the minute vastness of what is "inside-an-atom". 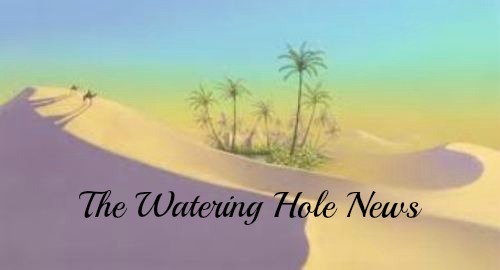 Isn't it meaningful then that in the process, having confined ourselves to findings regarding life-and-matter based on purely scientific principles, we end up using the same vocabulary we utilize in the Spiritual studies of Divinity? Surely this indicates how imperative it is to stay informed regarding scientific research into such concepts a Dark-Energy? Enhanced understanding can only help lead us to a more profound comprehension and visualization of our Creator God! 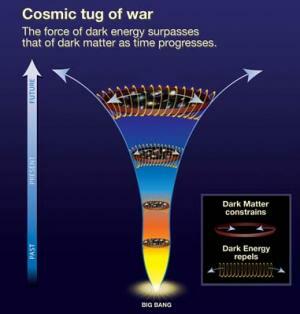 Dark-Energy: A new standard model for physics?